Received August 3, 2017; Revised August 20, 2017; Accepted August 20, 2017. AT-hook proteins of plant have shown to be involved in growth and development through the modification of chromatin architecture to co-regulate transcription of genes. Recently, many genes encoding AT-hook protein have been identified and their involvement in senescence delay is investigated. In this study, soybean transgenic plants overexpressing chromatin architecture-controlling ATPG7 gene was produced by Agrobacterium-mediated transformation and investigated for the positive effect on the important agronomic traits mainly focusing on yield-related components. A total of 27 transgenic soybean plants were produced from about 400 explants. T1 seeds were harvested from all transgenic plants. In the analysis of genomic DNAs from soybean transformants, ATPG7 and Bar fragments were amplified as expected, 975 bp and 408 bp in size, respectively. And also exact gene expression was confirmed by reverse transcriptase-PCR (RT-PCR) from transgenic line #6, #7 and #8. In a field evaluation of yield components of ATPG7 transgenic plants (T3), higher plant height, more of pod number and greater average total seed weight were observed with statistical significance. The results of this study indicate that the introduction of ATPG7 gene in soybean may have the positive effect on yield components. AT-hook proteins of plant have shown to be involved in growth and development through the modification of chromatin architecture to co-regulate transcription of genes (Su et al. 2006; Lim et al. 2007; Street et al. 2008; Xiao et al. 2009). Many AT-hook motif proteins were identified from a variety of species such as Arabidopsis, maize and rice in plants (Li et al. 2002). The modulation of chromatin architecture is induced by genes controlling DNA methylation and histone acetylation/deactylation and functional genes of chromatin binding. This chromatin architecture plays an important role in growth and development in plants including meristem identity, leaf longevity and the development of flowering and seed formation (Su et al. 2006; Lim et al. 2007; Street et al. 2008; Xiao et al. 2009). Recently, many genes related to senescence delay have been identified in a research team of Genomine Inc. (data not shown). Several genes encoded for AT-hook binding proteins have been investigated for their function in chromatin remodeling and subsequent senescence delay in Arabidopsis (unpublished data). Functional change of Arabidopsis in morphology due to senescence delay resulted in increased biomass and yield. Soybean (Glycine max [L.] Merr. ), as a major crop, is important for the production of vegetable oil and protein in worldwide. Many reports point to the beneficial effects of soybean on human health and even as a source for medicines (Oksman-Caldentey and Hiltunen 1996; Zeng et al. 2004; Manavalan et al. 2009; John et al. 2016). Soybean transformation has mostly been developed with Agrobacterium-mediated transformation (Hinchee et al. 1988), and improved rapidly by the use of half-seed explants (Paz et al. 2006). In our previous study (Kim et al. 2012), Soybean transformation efficiency was consistently improved with additional treatments such as addition of thiol compounds, sonication and vacuum. The improved efficiency made us enable to produce enough stable transgenic soybean plants with a few transformation trials. Ten to twenty healthy plants could be obtained from 300–400 seeds of explants. This improvement has substantial implication as a big forward step to functional genomics of soybean via transgenic research. With this modified transformation protocol, many genes have been introduced to soybean in order to investigate their physiological change or improvement in crops (Kim et al. 2013; Kim et al. 2016; Kim et al. 2017). In this study, we generated soybean transgenic plants overexpressing chromatin architecture-controlling ATPG7 gene by Agrobacterium-mediated transformation and investigated the important agronomic traits mainly focusing on yield-related components. ATPG7 (AT-hook protein of Genomine 7) gene (GenBank: DI237375.1) was provided by Dr. D.H. Lee (Genomine Inc., Korea) and was amplified by PCR using ATPG7-F primer (5′-ATGGATCCAGTACAATCTCATGGA-3′) and ATPG7-R primer (5′-TCAATACGGTGGTCGTCCCGTTGA-3′). The desired destination vector, pCSEN (provided by Dr. D.H. Lee) was used for the vector construction. The plasmid, pCSEN-ATPG7 was constructed and transformed into Agrobacterium tumefaciens strain EHA105 (Karimi et al. 2002), following the protocol described by Kim et al. (2013, 2016, 2017). Korean cultivar soybean seeds (Glycine max L. cv. Kwangankong) were utilized in Agrobacterium-mediated transformation experiments, following the protocol described by Kim et al. (2013, 2016, 2017). T0 plants with two trifoliates were screened using an herbicide assay to determine the resistance and to identify putative transformants that express Bar gene. The upper surface of a leaf was painted with 100 mg/L PPT using a brush. The response to the herbicide was observed at 3–5 days after PPT leaf painting. The PPT-resistant T0 plants were then grown in a greenhouse, and T1 seeds were harvested. Total genomic DNA was extracted from leaf tissues of non-transgenic (NT) and T0 soybean plants using the cetyltrimethylammonium bromide. The polymerase chain reaction (PCR) was performed to detect the introduced genes with KOD FX polymerase (TOYOBO, Japan) according to the manufacturer’s instructions, and two primer sets were designed to amplify regions of ATPG7 (5′-ATGGATCCAGTACAATCTCATGGA-3′/5′-TCAATACGGTGGTCGTCCCGTTGA-3′) and Bar (5′-TCCGTACCGAGCCGCAGGAA-3′/5′-CCGGCAGGCTGAAGTCCAGC-3′). PCR was performed using KOD FX polymerase (TOYOBO, Osaka, Japan) according to the manufacturer’s instructions. Total RNAs were isolated from NT and T0 soybean plants using Plant RNA Purification Reagent (Invitrogen, USA) according to the manufacturer’s instructions. Reverse transcriptase-PCR (RT-PCR) was performed using Maxime RT-PCR Premix (iNtRon, Korea) according to the manufacturer’s instructions. The primer pairs used in the RT-PCR were as follows: ATPG7 forward, 5′-ATGGATCCAGTACAATCTCATGGA-3′/reverse, 5′-TCAATACGGTGGTCGTCCCGTTGA-3′; Bar forward, 5′-TCCGTACCGAGCCGCAGGAA-3′/reverse, 5′-CCGGCAGGCTGAAGTCCAGC-3′. The constitutively expressed gene TUB was used as a control and amplified using the primer set 5′-TGAGCAGTTCACGGCCATGCT-3′/5′-TCATCCTCGGCAGTGGCATCCT-3′). NT and transgenic soybean seeds (T3 generation) were planted in a seedling tray, and treated with 100 mg/L PPT for the herbicide assay. Seedlings were then transplanted in GMO field (Keunwi, Kyungsangbukdo) in order to evaluate yield components including plant height, the number of branches per plant and the number of nodes per plant. Moreover, the number of pods per plant and the total seed weight were also determined to investigate the relative yield of transgenic plants. 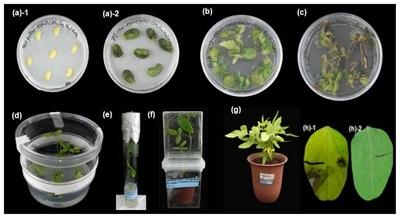 To produce transgenic soybean plants with high-yield, the corresponding pCSEN-ATPG7 plasmid (Fig. 1) was used for the soybean transformation with half-seeds of the Korean soybean cultivar Kwangankong (Fig. 2) described by Kim et al. (2013, 2016, 2017). A total of 27 transgenic soybean plants were produced from about 400 explants. T1 seeds were harvested from all transgenic plants. The whole procedure, starting from seed preparation to T1 seed harvest, has taken about 6–7 months. Further generations were proceeded until T3 generation in GMO field (Keunwi, Kyungsangbukdo). To confirm the integration of the transgene in soybean transformants, genomic DNAs were isolated from T0 transformants, and PCR was carried out to analyze the presence of ATPG7 and Bar genes, respectively (Data not shown). Only healthy and well-grown transgenic line #6, #7 and #8 were selected for the investigation of agronomic characteristics, and these lines were examined using PCR with ATPG7 and Bar primers to amplify the DNA fragments of 975 bp and 408 bp in size, respectively (Fig. 3a). 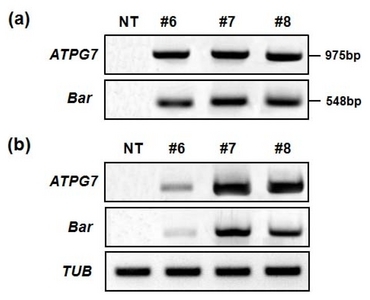 To analyze the transcript levels of ATPG7 and Bar, reverse transcriptase-PCR (RT-PCR) was carried out with RNAs extracted from transgenic line #6, #7 and #8. As shown in Fig. 3b, these genes were expressed in all 3 lines tested. To examine the yield components of ATPG7 transgenic plants (T3), we compared their agronomic characteristics to those of NT plants in GMO field. Agronomic traits including plant height, the number of nodes per plant, branches per plant, pods per plant and total seed weight of plants and transgenic lines (#6, #7 and #8) were investigated (Fig. 4). The plant height of transgenic lines was similar to, or higher than NT plants. The number of pods in transgenic lines was more than those of NT plants, as showing about 16%, 38% and 40% increase in line #6, #7 and #8, respectively. In total seed weight, transgenic line #6, #7 and #8 showed approximately 15%, 60% and 40% greater than non-transgenic plants with statistical significance (P < 0.05 in line #6 and P < 0.01 in line #7 and #8). This result is significantly related to the yield increase. Therefore, the important yield components of transgenic line #6, #7 and #8 were more favorable for high yield than those of normal wild-type plants. Relatively large number of stable transgenic plants was obtained in this experiment. We have been observed the transformation efficiency varied by different genes and constructs. The production of 27 plants out of 400 explants is relatively high frequency. The result might be from the additional treatments. Before we used the modified method, average efficiency of transformation was less than 3% (unpublished data). Our Agrobacterium-mediated soybean transformation was primarily established based on the cotyledonary-node (CN) method. Then half-seed method was mainly used for recent transformation experiment. The later method skipped the germination procedure of soybean seed on germination media. The biggest advantage of half-seed method is saving at least one week in the early procedure of transformation and no requirement for sophisticated wounding on explant. This modified protocol enabled us to produce the successful soybean transgenic plants with many genes (Kim et al. 2012; Kim et al. 2013, Kim et al. 2016; Kim et al. 2017). Many chromatin architecture-controlling genes via senescence delay, which created phenotypic change including organ size of plants and yield components, have been discovered by a research team of Genomine Inc. They obtained the result on the basic function of these genes with transgenic research in model plant, and hope to see similar result in crop like soybean. It may be too early to say the positive effect of those genes in the yield components of soybean with our limited results. Further generation should be evaluated for their yield-related main agronomic characters and connection with gene expression. The year of 2017, we have deployed next generation of 3 lines (#6, #7 and #8) to investigate the correlation between field performance of transgenic plants and gene expression at the cell level. The current result suggests that the overexpression of ATPG7 gene in soybean contribute to the positive effect on yield components, indicating the modification of senescence could lead to yield increase. Considering the daily accumulating new genes from genomic research, transgenic research based on high-efficient transformation will have an important role in many respects. More active trial with transgenic crop should be carried with new candidate genes. Fig. 1. Vector used for soybean transformation. Schematic representation of the vector pCSEN-ATPG7 containing ATPG7 and Bar genes used for soybean transformation. The BglII and BstEII restriction enzyme sites are also marked. LB/RB: left/right T-DNA border sequences, p35S/T35S: CaMV (cauliflower mosaic virus) 35S promoter/terminator, pSEN: stress-inducible promoter, Bar: coding region of the DL-phosphinothricin resistance gene. Fig. 2. Production of soybean transgenic plants with ATPG7 gene using Agrobacterium-mediated transformation. (a) Co-cultivation of half-seed explants after infection (left) and at five days after inoculation (right); (b) Shoot induction medium without PPT; (c) Shoot induction medium containing 10 mg/L PPT for Bar selection. (d) Shoot elongation medium containing 5 mg/L PPT; (e) Rooting medium; (f) Acclimation of putative transgenic plant in a small pot; (g) Transgenic plant (T0) grown in a large pot in a greenhouse; (h) Leaf painting with herbicide (100 mg/L PPT) to reveal the sensitivity of non-transgenic plant (left) and resistant of transgenic plant (right). Fig. 3. Analysis of transgene integration and expression in ATPG7 transgenic plants (T0). (a) Confirmation of introduced genes in ATPG7 transgenic plants (T0) using PCR. Genomic DNAs were extracted from T0 transgenic leaf tissues. (b) ATPG7 and Bar gene expression in T0 transgenic plants using reverse transcriptase-PCR (RT-PCR). Total RNAs were extracted from T0 plants, and then analyzed by RT-PCR with the TUB gene as a quantitative control. NT: non-transgenic plant, #6–8: ATPG7 transgenic lines (T0). Fig. 4. Agronomic characteristics of T3 transgenic plants in GMO field. 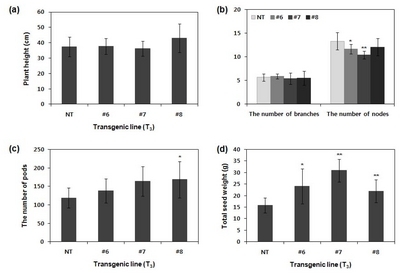 NT and T3ATPG7 transgenic plants (n=20 for each line) were grown in GMO field, and agronomic traits including plant height (a), the number of branches and nodes per plant (b), the number of pods per plant (c) and total seed weight (d) were investigated. Error bars indicate mean±standard deviation. Asterisks indicate significant changes compared with NT (*P<0.05; **P<0.01). NT: non-transgenic plants, #6–8: ATPG7 transgenic lines (T0). John, KMM, Natarajan, S, and Luthria, DL (2016). Metabolite changes in nine different soybean varieties grown under field and greenhouse conditions. Food Chem. 211, 347-355. Karimi, M, Inzé, D, and Depicker, A (2002). Gateway™ vectors for Agrobacterium-mediated plant transformation. Trends Plant Sci. 7, 193-195. Kim, MJ, Kim, HJ, Pak, JH, Cho, HS, Choi, HK, and Jung, HW (2017). Overexpression of AtSZF2 from Arabidopsis showed enhanced tolerance to salt stress in soybean. Plant Breed Biotech. 5, 1-15. Kim, MJ, Kim, JK, Kim, HJ, Pak, JH, Lee, JH, and Kim, DH (2012). Genetic modification of the soybean to enhance the β-carotene content through seed-specific expression. PLoS One. 7, e48287. Li, G, Hall, TC, and Holmes-Davis, R (2002). Plant chromatin: development and gene control. BioEssays. 24, 234-243. Lim, PO, Kim, Y, Breeze, E, Koo, JC, Woo, HR, and Ryu, JS (2007). Overexpression of a chromatin architecture-controlling AT-hook protein extends leaf longevity and increases the post-harvest storage life of plants. Plant J. 52, 1140-1153. Manavalan, LP, Guttikonda, SK, Tran, LSP, and Nguyen, HT (2009). Physiological and molecular approaches to improve drought resistance in soybean. Plant Cell Physiol. 50, 1260-1276. Oksman-Caldentey, KM, and Hiltunen, R (1996). Transgenic crops for improved pharmaceutical products. Field Crops Res. 45, 57-69. Sreet, IH, Shah, PK, Smith, AM, Avery, N, and Neff, MM (2008). The AT-hook-containing proteins SOB3/AHL29 and ESC/AHL27 are negative modulators of hypocotyl growth in Arabidopsis. Plant J. 54, 1-14. Su, Y, Kwon, CS, Bezhani, S, Huvermann, B, Chen, C, and Peragine, A (2006). The N-terminal ATPase AT-hook-containing region of the Arabidopsis chromatin-remodeling prtein SPLAYED is sufficient for biological activity. Plant J. 46, 685-699. Xiao, C, Chen, F, Yu, X, Lin, C, and Fu, YF (2009). Over-expression of an AT-hook gene, AHL22, delays flowering and inhibits the elongation of the hypocotyl in Arabidopis thaliana. Plant Mol Biol. 71, 39-50. Zeng, P, Vadnais, DA, Zhang, Z, and Polacco, JC (2004). Refined glufosinate selection in Agrobacterium-mediated transformation of soybean [Glycine max (L) Merrill]. Plant Cell Rep. 22, 478-482.